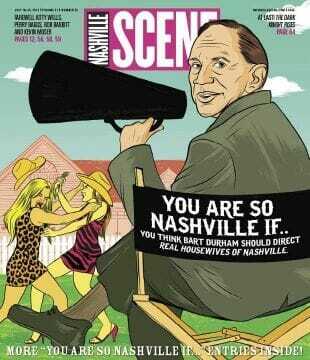 Nashville’s alternative weekly, the Nashville Scene, asks readers every year to complete the sentence: “You are so Nashville if…”. Winners are featured in a summer edition. It is not unusual for Bart Durham to be referenced in a submission or two. This year, the winning selection was, “You are so Nashville if you think Bart Durham should direct the Real Housewives of Nashville”. Here is more about the winner of this year’s contest from the July 19, 2012, edition of the Nashville Scene.